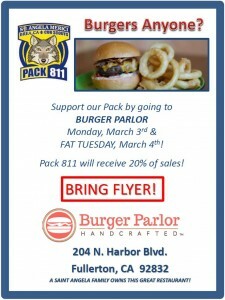 Our Cub Scout Pack is having a fundraiser this week at the Burger Parlor in Fullerton (204 N. Harbor Blvd). Please join them for lunch or dinner on Monday or Tuesday. A SAM family owns this great restaurant. What better way to enjoy the Fat Monday or Fat Tuesday before Ash Wednesday? Please bring this flyer with you so the pack can receive credit.